Hello everyone and back again with more exciting news. We’ve been working hard to finsh off all the great work that the team has done leading up to and during our FreePBX-athon last week (this one also). We think you are going like the new addtions we have added to this Beta2 release. Below are some highlights but the best way to find out what it is all about is to go upgrade your Beta1 systems through the Online Upgrade system, or go grab the new tarball and go through the same install_amp that you always have used! Well, we were holding back a little because behind the scenes was a lot of work to give the overall GUI a new face lift that we hope will be to your liking. We’ll walk you though some highlights of what we’ve done to wet your apetite, and then let you pull the new Beta2 and see for yourself while helping us flush out the last bugs so we can quickly get this into a release candidate! Below is a snapshot of the new index page which lets you see a vast amount of the changes in a single screenshot. First off, you’ll notice the new logo and our friendly mascott. Your comments and feedback are welcome! For now, let’s walk through the index page below. The notificaition box represents a portal where you are presented with variety of notifications from throughout the system. This ranges from new online updates, critical errors, default password usage and more. Substantial detail about the notifications are just a click away. Behind the scene is a full notification framework that can be used from within and outside FreePBX. We will be providing documentation to this API shortly for those developers who want to hook into the notification framework. Lastly, we have the current state of critical server components that are core to the system. The days of remembering to check for online updates are over. You can now setup the system to check for you. When new updates become avalable you will see them in the notification frame, and optionally you can have them emailed to you as well. One more big change before letting you go explore all those little things we did not mention is how core destinations are handled when configuring modules. In the past there was one category called Core which included extensions, voicemail and a handful of random functions like hangup and busy. This has been split into 3 new categories: Extensions, Voicemail and Terminate Call. New to the Voicemail category is a choice of either busy ore unavailable greeting for each voicemail box. You can look at the CHANGES file that is packaged with the tarball to get a summary of the remaining changes in Beta2. For those of you who were around for the move from version 2.1 to version 2.2 you will remember the problems with Internet Explorer, some of which never went away. Well as we strive to improve the usability and look and feel of the system we run into more woes with IE’s inability to follow standards. We are aware that some things look quite ugly in IE6. Getting the new layout to a point where it was even functional on IE6 was a good chunk of last week’s cleanup work. It does look a lot better on IE7. Now that we have gotten Beta2 out the door, we will continue to visit the IE6 issues. If you have fixes, please submit them and we will do what we can. In the meantime, Firefox continues to be the browser of choice for the FreePBX Administration Console. One of the last improvements made that we are Beta testing with this Beta2 release is the ability to upgrade from Beta1 to Beta2 with the online system, not requiring the old download of the tarball and then running install_amp. You can still go that route however you can simply do what you have been doing during the current Beta1 program, and install the new Framework update which will take you to Beta2 through the online system. (For those of you not familiar, this is just another module called FreePBX Framework that you upgrade in the Module Admin panel.) So, give it a try and let us know if you are running into issues. Alternatively, here are the traditional instructions for either a new install or upgrading the old way. Make sure you are logged in as root; get the tarball, unpack it and install it on your system with install_amp. Then make sure Asterisk is running. Enough of your time, thanks for reading, go try it out and tell us what you think. Come back and post your comments! 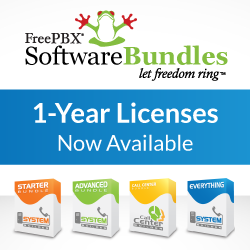 Next PostPress Release – FreePBX 2.3.0 Ships!